You will love this! 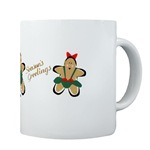 This is such a cute mug I came across with a smiling Gingerbread faced pair on the mug. One side is a smiling Gingerbread man face and the other side is a smiling Gingerbread woman face. These Gingers are so cute in their formal holiday attire; Gingerbread woman wears a pretty green dress with red buttons and he hair is festooned with a red matching bow. Gingerbread man wears a handsome green vest complete with red buttons. 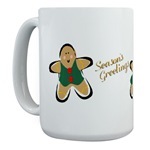 Mug says “Seasons Greetings” across the front. This is a great gift idea for the Gingerbread enthusiast you know and would also be a super cute idea to have a set of these on-hand for your upcoming cookie exchange party and perfect for serving coffee, tea, and a yummy Gingerbread Latte for friends and family that will be stopping by. Order now to ensure holiday delivery as these will sell out – visit here G2 Notes!! G2 Notes has a neat “exclusive” Gingerbread collection with a great selection on one-of-a-kind Gingerbread items. Being the Gingerbread lover I am, my order was just placed – I am so excited to receive these Ginger cuties!! Mug comes in two sizes & the large mug holds 15 oz.